B-Line Tire & Auto Supply Ltd. is a distribution company specializing in tire supplies, shop equipment, tools and accessories as well as automotive/car wash supplies. The company was founded in 1985 by Mike Bolduc and it has grown to become an industry leader. With fully stocked warehouses and supply trucks across Canada, the knowledgable team at B-Line is proud to offer superior quality products and outstanding customer service. Many of B-Line's employees have been with the company for over 20 years. It is a family business that is proud to be team oriented and 100% Canadian. Our team of sales representatives have many years of experience in the industry; they have a strong understanding of the unique needs or requirements of each customer. B-Line has specialists that focus on specific areas of the tire supply industry such as equipment sales or TPMS ensuring that the customer has the most knowledgeable resources available. Our product offering goes beyond wheel weights and tire patches. Everything from tire shine, gloves, and impact guns to balancers, TPMS sensors or retreading supplies, you can find just about everything you will need for your tire business. It is becoming increasingly important to have properly trained tire technicians B-Line offers the most up to date training on changing, repairing, and balancing tires. B-Line also specializes in TPMS training and offers a wide variety of TPMS information. Specialized sales representatives can assist you with any issues you might have, as well as provide both on and off-site training seminars. B-Line's business model allows for the most direct flow of supplies and value added operations from the manufacturer to the end user. Most of the products at B-Line are purchased in bulk directly from the manufacturer, eliminating various levels of markup. Buying power, relationships with vendors and a solid distribution network ensures the most competitive price without sacrificing service or quality. 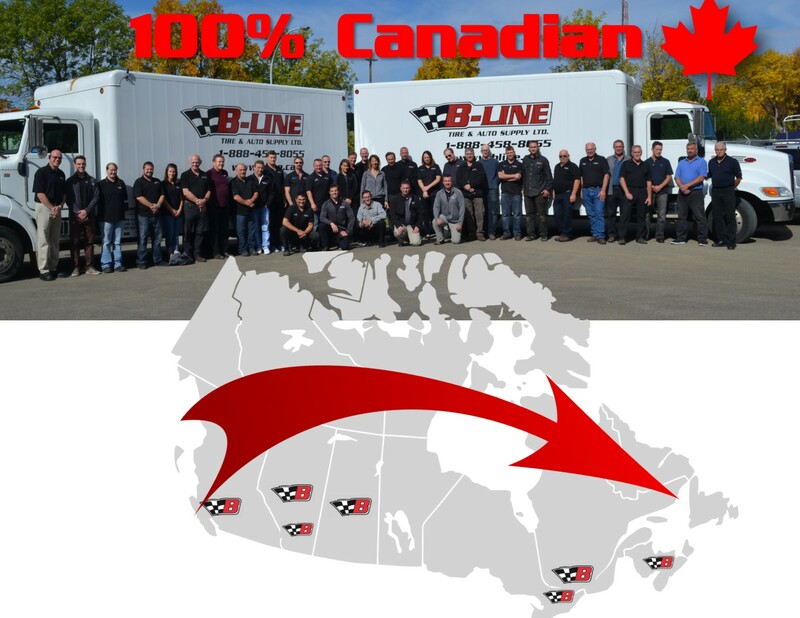 B-Line is one of the only tire supply companies in Canada offering a hybrid system of distribution. You have the option to purchase your supplies off a fully stocked truck, as well as ordering from one of the warehouse locations by fax, email, or online at www.bline.ca. We do not charge freight on most shipments, and they arrive at your door in 1-4 business days. B-Line works closely with vendors and through rigorous testing as well as feedback from the field we can determine the most effective tools and supplies. Hunter, Corghi, Tech, Counteract, Schrader, Fuller Brothers, and many other brands that B-Line distributes are top of the line, quality products that you can trust to provide exceptional results.